Today the glittery orange Ancestral Box on my desk caught my eye and I opened it. The images of my Grandmothers I had cut out and pasted in it were there to greet me, along with my great grandmother and other women in the family who influenced me. 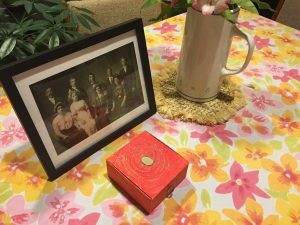 When I started my Ancestral work as part of an academic program, I created this sacred box on Halloween – the time of year when we remember those who have died – to ask for help and guidance from them. It is full of intention and hope, beauty and promise. Inside rests the gold heart-shaped locket of my paternal grandmother, Anna Casagranda. It opens to two faded photos, one of my Dad, John, and the other of his brother Frank. They are young men in the photo, with their lives ahead of them. Only one of them was to have his life fulfilled – the other, my uncle, was to die tragically in a mining accident at age 26, the very breath of life taken from him. Recently I returned from the land of my grandparents, the beautiful mountainous province of Trentino, Italy. My sister and I decided to try to find the house where our Grandmother Casagranda was born in Bedollo, a village built on a steep hillside with a sweeping view of the surrounding hills. We thought if we walked the steep path, we would recognize the house, but we did not. It had been too many years – more than 30 – since we had been there. After the deaths of our primary contacts there, and of our own father, we lost touch. A spry older woman was walking down the steep path, so I asked her if she knew which house belonged to Pietro, my grandmother’s brother. “Cerchiamo la casa di mia nonna paternale,” I explained, showing her a photo of my grandmother and her siblings. She took us back up the path and showed us which house it was. “And, if you go now,” she advised, “one of your cousins is down in the cemetery!” We followed her down the steep path to the cemetery near the church, not sure what to expect. There we met Marlène, and later Anna Maria, both cousins. They showed us the graves of their parents and grandparents and our mutual great grandparents, Francesco Casagranda and Domenica Mattivi. We stood and visited among the graves in the warm slanted light of autumn, the golden hills all around us. It was October 18, the death anniversary of our grandmother. Did she have a hand in this chance meeting? Our timing could have been so different. The kind woman we happened to meet, Maria, seemed like a kind of angelic messenger whom we hugged and thanked upon her departure. This wasn’t the first time my paternal grandmother influenced my path. When I was 19, Anna Casagranda died, and dispersed her savings among her seven grandchildren, two thousand dollars each. Although I was a college student, working to pay my tuition and rent, I decided to use the money to go to Europe with my lifelong friend Margie O’Brien, who had invited me. This money allowed me to say yes. Margie’s dad encouraged us to travel by Italian steamship. It was a hefty sum for a one-way passage, but we took his advice. That left just enough money, if we were frugal, to travel for the summer. In June, we boarded the SS Raffaello in New York and sailed with an Italian crew and several Italian passengers to Napoli. That summer was transformative. We travelled by train through Western Europe, meeting kids from around the world at the youth hostels where we stayed. When we were in Innsbruck, Austria, we both thought we might have relatives there, so we went to a cemetery. At the time I knew precious little about my heritage. For me it was the beginning of a lifelong quest to find relatives – and of several visits to cemeteries. I later learned that, although my grandparents’ birth certificates said Austria, their villages were now in Italy. On that trip, I wore the locket of my grandmother whose death had allowed me to make this journey. Her monetary gift opened a door to my European heritage that has remained open for many journeys throughout my life. Thank you, Anna Casagranda, for the voyage to my past, and the journey to my future. 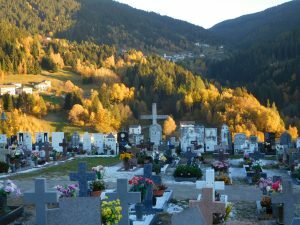 This entry was posted in Family, Journeys, Trentino and tagged cemetery, Grandmother by Mary Beth Moser. Bookmark the permalink. Our ancestors may leave us in body but their spirit lives on within each of our souls. They are there to guide us and give us strength through their wisdom. We did not know Anna well. She loved her grandchildren more than we ever realized as children. She loved all of us. She was very poor, and yet left each of us a gift of money. I’m happy to know what you did with your money. I loved that house. And now you are influencing your Grandchildren in beautiful ways with your gifts and values, your strength and wisdom. Thanks for reading my posts, Sis, I appreciate it. Mary Beth, You have artfully woven together two stories into one amazing post. The first gives us readers a glimpse into today’s life in a small Italian village, through a “chance” meeting in a cemetery, at which you could feel the spirit of your grandmother. The second touches my heart with warmth, as I remember the two of us, you and me, travelling via the SS Raffaello to visit and explore Europe for a summer during our college years, you wearing your grandmother’s locket, and the two of us learning about our wide and wonderful world. Your grandmother’s spirit and her gift spread even to me, I can see that now. Without her, we could not have had that journey together. Thank you Grandma Anna! I appreciate your words and sentiments, here, my dear Friend! With gratitude for you and all we have shared. My grandfather was Matthew Casagranda, and was born in Bedollo. I am planning a trip there in Sept 2018 . I know there was an Aunt Anna to my Mom. Matthew arrived in the US in 1909. He was married to my Grandmother Emma Cologna, they lived in Telluride Colorado. He died in 1920. I wonder if there is any connection?? Thank you for writing, Bev! Anna Casagranda had eight siblings, including Matteo (Matthew), born 1882 or 1883 in Bedollo. It looks like Matteo was married in Telluride in 1908 to Carlotta Ress and died in 1928. How exciting that you are going to Bedollo! I hope you can find your relatives. Often there are several families in the villages there that have the same surname. We may be related several generations back. . .